With Elfsight Twitter plugin, you can add on your site a customized feed of one of the most popular social media. 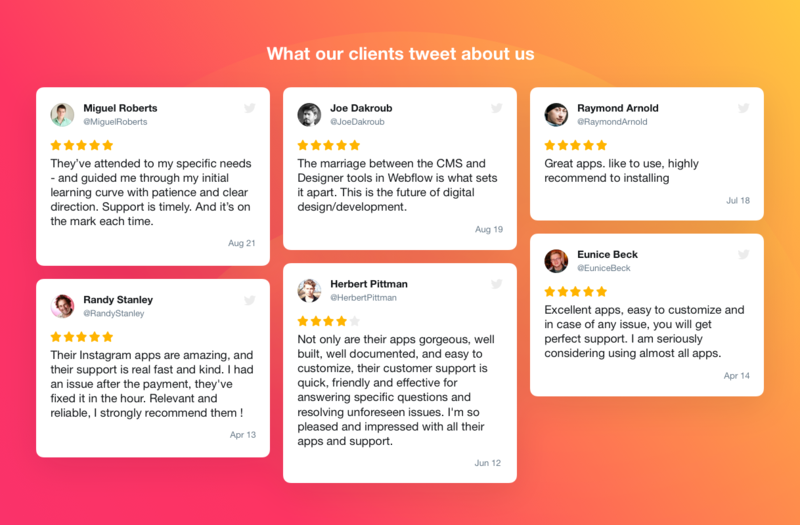 Embed your own Twitter feed with header and action buttons, create a collection of Tweets by hashtag or display customer testimonials about your products from Twitter. Allow your users all Tweet actions right on the website: retweet, reply, like, share. Choose the best layout, add colors and find the right proportions of the widget. 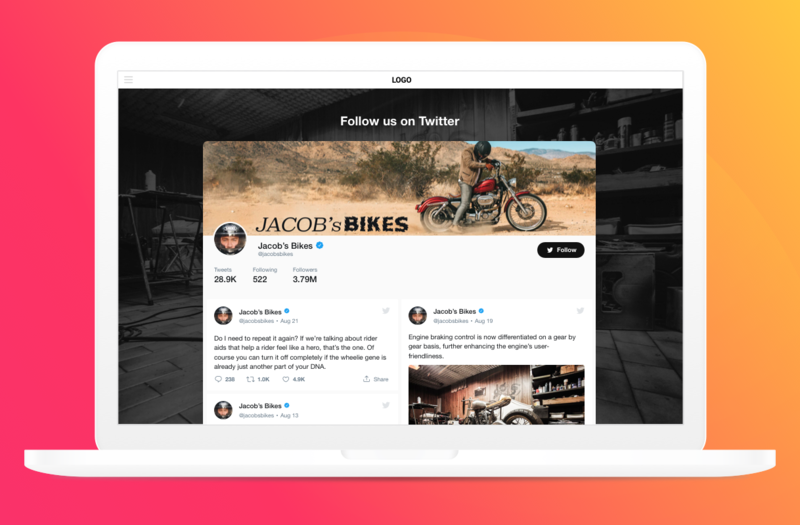 Increase the number of followers and grow engagement on your site with lively and interactive feed. Insert your username and WordPress Twitter plugin will display all posts of your Twitter account on the website with real-time functionality. 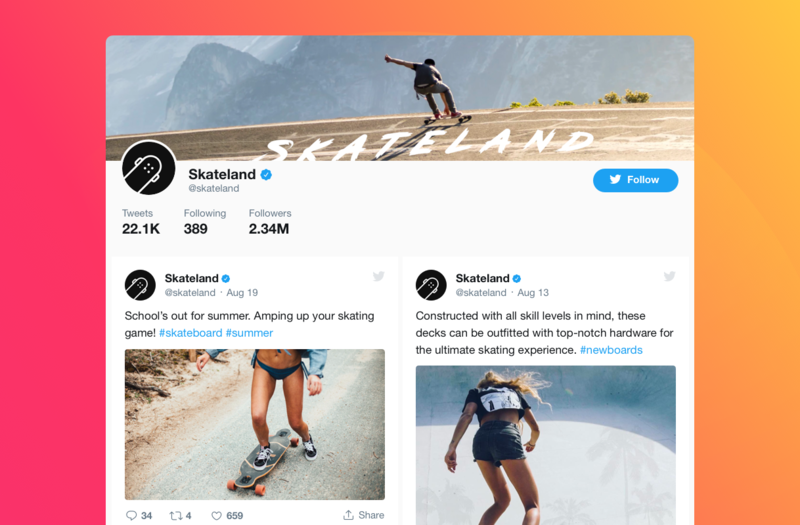 Widget header will show your cover picture, name and statistics; all Twitter actions will be available right in the feed. Choose the hashtags that you need, insert them into the source field of the widget and your feed will automatically find and display all Tweets that have those hashtags. You can use testimonials that Twitter users leave about your business to create a collection for your website. A special Testimonials layout will display a chain of Tweets with author’s name, text and star rating. 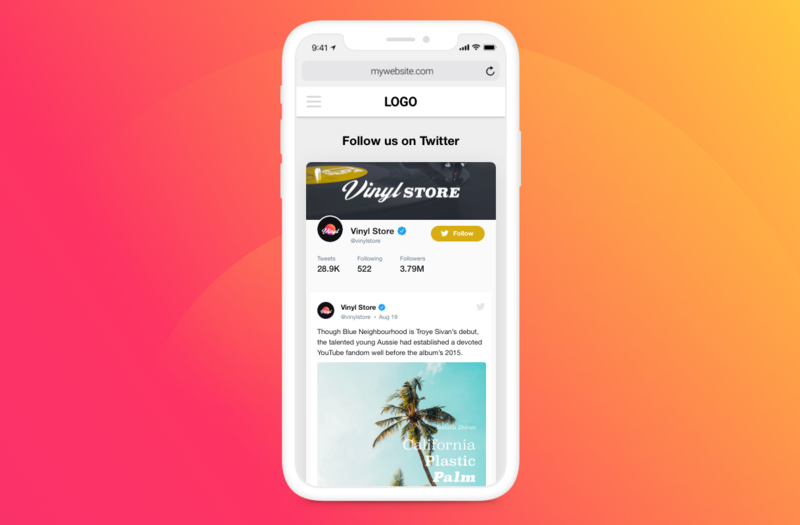 Widget header has two variants: Default shows all elements: cover picture, author name, counts, Follow button, and Twitter icon; while Compact has only username and Follow button. 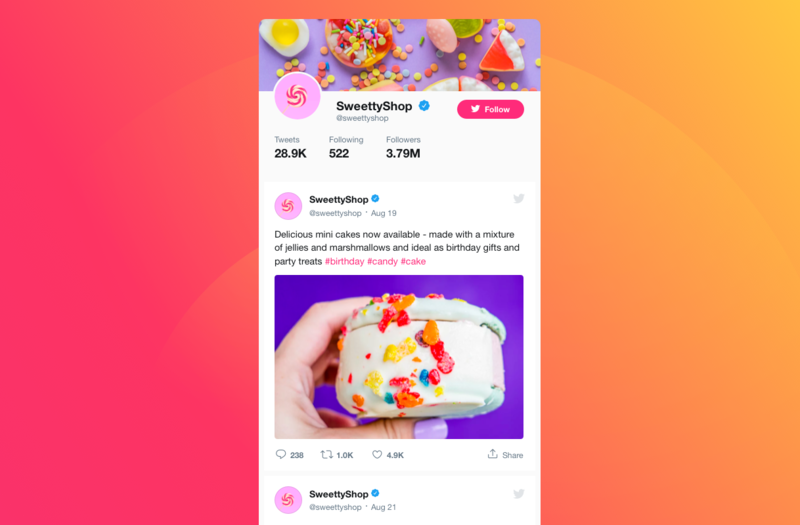 You can adjust the Tweets to show or hide author, date, and Twitter icon, and the action buttons with counts: Like, Share, Retweet or Reply to the Tweet. Set any parameters of height and width by just inserting the number of pixels or percentage. If you leave “auto”, your Twitter feed will automatically adapt the height to the content of the feed. 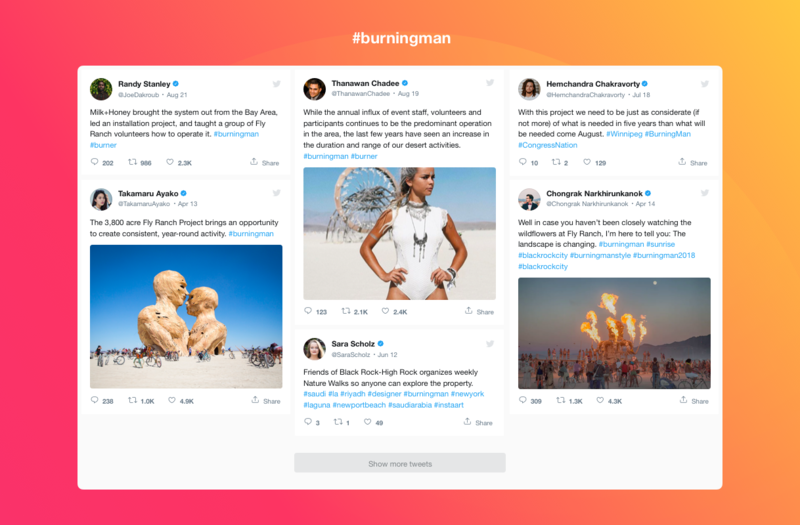 Choosing theme color option will paint the active elements of the interface: Follow button, links, hashtags, and Twitter icons. The Twitter plugin for WordPress is translated into 22 languages. Just choose the one you need for your audience. If you can’t find the required language, you can request it from us. Easily place Elfsight Twitter Feed widget to any WordPress sidebar or footer of your website for smooth user experience. Upload setup zip to your website. IMPORTANT! At this step, make sure you upload not a full item zip, but just WordPress installable zip. Build a new widget then customize it with Live Widget Editor. Simply copy and paste the shortcode of your widget to the preferred page of your website. Congratulations! Now your Twitter plugin for WordPress is up and running! Then just open a ticket in our Support Center at https://elfsight.ticksy.com/ and we will be back with professional help quickly. Expect our response Monday-Friday from 10am to 7pm CET. We are open to our customers and willing to get better! We are a close-knit and trusted team of full-time developers having 10-year experience. Sharing common goals and putting our best into what we are doing make us successful. One of our priorities is to bring the feeling of satisfaction with our products to the clients! So you can always rely on us! Our Twitter plugin doesn’t work properly on your WordPress website? Then report your issue or bug by describing it in details and send us a link to your website. We’ll do our best to resolve your problem. We release new updates and features regularly. Just don’t forget to check for the fresh version in your WordPress admin panel. We are always open to your ideas. If you require some specific features, which could also improve our products, then just share it with us. We will consider embedding them in our future Twitter Feed updates. We don’t provide installation services for our plugin installation services. However, we’re glad to offer you installation guides. And if any errors appear during installation, feel free to contact us. If you still would like installation to be fulfilled by a professional, you can contact specialists from Envato Studio. We don’t offer plugin customization services. If you would like to adjust the way some features operate, express your ideas, and we will consider them for future updates. If you can’t wait, feel free to contact Envato Studio for customization services. We do not fix bugs or solve issues in relation to other plugins and themes, developed by 3rd-party developers. Also we don’t provide integration services for third party plugins and themes. Feel free to contact us at support@elfsight.com and share your feedback. In case there’s something you wish to see in the Twitter Feed plugin, we’ll be glad to hear your thoughts. The most requested changes will be introduced into new updates to make our clients satisfied and help them achieve their aims. If you need any custom feature right now, feel free to contact Envato Studio for customization services. Still haven’t checked our plugin live? Do it right now on the WordPress Twitter Feed plugin page!